If you want to teach your child how to ride a bicycle this is the way to start! This will teach them the skill of how to peddle on steady wheels. 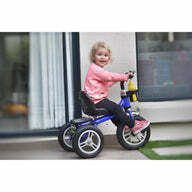 The Little Bambino Bicycle will give your little one the confidence they need before moving on to their own big bicycle! Come on outdoors! Your child can learn new motor skills and enjoy the outdoors while they're at it. Perfect for ages 2-5!